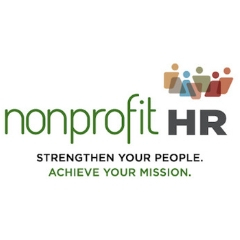 Nonprofit HR is the nation's leading talent management capacity building firm dedicated to meeting the workforce and culture needs of the social sector. We believe that there is power in empowering nonprofits to achieve their full potential through their people. Over the last few years, we have seen the sector increase its focus on talent management and its impact on mission outcomes and organizational sustainability. And while there continues to be limited data available on nonprofit talent management practices, Nonprofit HR remains committed to helping close this gap. In this annual survey, Nonprofit HR is seeking input from nonprofit leaders about their retention practices for 2019. The survey takes less than 10 minutes to complete. Nonprofit HR values your organization's confidentiality and is committed to ensuring that your organization's identity will not be disclosed as part of this survey process. Responses will be collected and shared in aggregate with survey participants and the sector in an effort to better inform talent decisions and investments for 2019 and beyond. Results of this survey will be released in May 2019. As a respondent, you will be among the first to receive a copy of the results. Thank you for your participation. We appreciate your time.